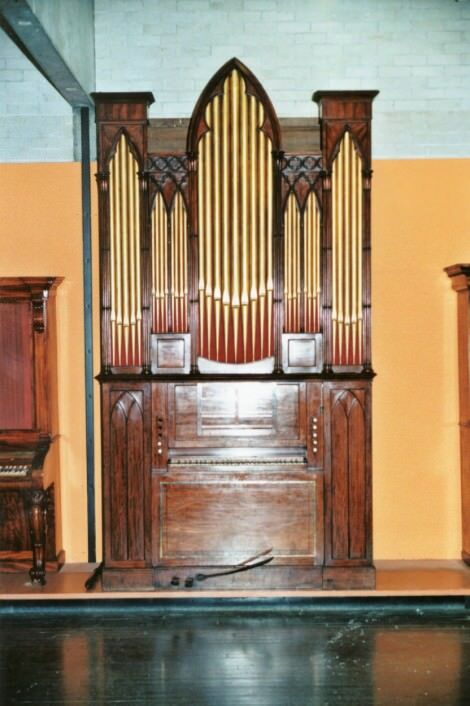 This organ is very similar in style to others by James Bruce of Edinburgh (e.g. John Barnes’s), that it may well be by him (see Alan Buchan’s article in BIOS Journal 21). There is what looks like a monogram on the f³ key, and possibly on the bass pallet. The organ would date from around 1830. It may be that it was moved to Llanfihangel by Jardine (whose label is glued to a back panel). Whiteley of Chester last maintained the organ and rebuilt it, probably about fifty years ago. They removed the swell box, with its pipes and keys, added the octave coupler, a Gamba and its upperboard at the back, the plastic stop knobs and re-leathered the pallets about 1950. The chapel in which the organ spent the last part of its life became redundant in the 1970s and lost its roof. The organ started to fall apart with dampness. In 1987 the organ was offered to the Museum of Welsh Life, and in 1997 it was restored by James Collier of Martin Goetze & Dominic Gwynn. It is now in the Museum of Welsh Life at St Fagans near Cardiff. There is a shifting movement (with two pedals – off and on). There is a foot pedal for the player and a handle for an assistant. The compass is GG to f³ without GG#. The keyboard slides into the case; Whiteley had fixed it for use with the octave coupler. It has ivory naturals and ebony sharps. So it looks as if the Swell had a Stopped Diapason, Dulciana and Principal. It must have been short compass, perhaps c¹-f³, but there is no sign of that. The idea of two sliding keyboards is very unusual but not impossible. The case is a light-coloured mahogany, with furniture-Gothic ornament. The case measures 3250mm tall, 1655mm wide and 765mm deep. Most of the ornaments were missing and only some have been replaced.